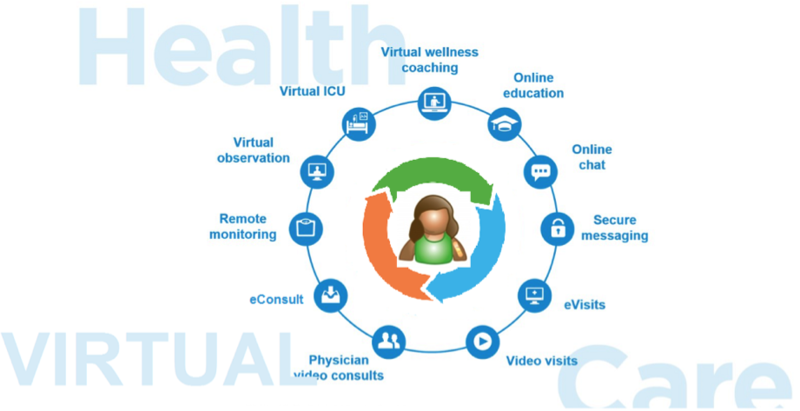 IEHP virtual care strategy covers a wide range of services and approaches, including increasing access to psychiatry, connecting members in rural areas to specialists, using electronic consults (eConsult) to enhance communication between providers, and integrating physical and mental health. The Patient Protection and Affordable Care Act (ACA) has dramatically expanded coverage to people who were previously uninsured or underinsured. Health insurers must now meet the needs of these newly-covered individuals, including access to specialty care in what are often medically-underserved regions. The application of technological advancements to health care delivery, which encompasses “telemedicine,” “telehealth,” and “mobile health” may be leveraged to meet the growing demand for care. In California, there are no legal prohibitions to using technology in the practice of medicine, as long as the practice is done by a California licensed physician. Traditional industry terms like telemedicine and telehealth do not allow for the flexibility to include newer care programs, technology, and infrastructure advancements. Alternatively, virtual care could encompass wellness programs, specialist consult (eConsult), virtual inpatient observation or care team collaboration across the continuum of care. Virtual care includes all modalities of providing healthcare services at a distance, through platforms such as telehealth, mobile health (mHealth) and Internet-based data exchange and communications. The development of Virtual Care as a burgeoning sector of the overall health care industry is a result of several factors. First, the broad adoption of telecommunication technologies has contributed to patient and provider “readiness” for Virtual Care. Second, health care consumers demand a health care system where convenience and access are an expectation. Finally, the need to balance provider access and cost containment has driven the adoption of virtual care. The traditional barriers to telehealth – lack of reimbursement and health insurance coverage, restrictive state licensure laws, and the absence of protocols for telemedicine visits – are disappearing quickly. Recent health care reforms have created a fundamental paradigm shift in focusing efforts on driving wellness and preventive care rather than on episodic care. The long-term relationship between the patients and providers has put patient engagement and care coordination at the center of care delivery. This need has created more viability for adopting Virtual Care programs, providing convenient, clinically valuable and cost-effective ways for patients and providers to interact, and expanding to provider-to-provider with eConsult. To improve patient access and cost management across the care continuum, many hospitals and health systems are using telehealth technologies to deliver high quality care in a timely fashion. Using an ecosystem of virtual and remote services and technology, health plans will be able to support high quality, cost-effective care at a distance. Transmission of recorded health history (for example, pre-recorded videos and digital images such as x-rays and photos) through a secure electronic communications system to a practitioner, usually a specialist, who uses the information to evaluate the case or render a service outside of a real-time or live interaction. eConsult is a store-and-forward technology that enables primary care providers to dialog with specialists as part of a referral and authorization for specialty care. As compared to a real-time visit, this service provides access to data after it has been collected, and involve communication tools such as secure email or messaging. Store and forward technology like eConsult can be utilized to help access specialty care, even when there are limited board-certified specialists in their community. Live, two-way interaction between a person (patient, caregiver, or provider) and a provider using audiovisual telecommunications technology. This type of service is also referred to as “real-time” and may serve as a substitute for an in-person encounter when it is not available. Live video telehealth can be a lifesaving technology. Live video can be used for both consultative and diagnostic and treatment services. Personal health and medical data collection from an individual in one location via electronic communication technologies, which is transmitted to a provider (sometimes via a data processing service) in a different location for use in care and related support. This type of service allows a provider to continue to track healthcare data for a patient once released to home or a care facility, reducing readmission rates. Remote patient monitoring can help keep individuals stay healthy in their home and community, without having to physically go to the providers’ office. Health care and public health practice and education supported by mobile communication devices such as cell phones, tablet computers, and PDAs. Applications (Apps) can range from targeted text messages that promote healthy behavior to wide-scale alerts about disease outbreaks, to name a few examples. Within each of these four domains, there are a variety of technologies that can be used to facilitate virtual care interactions. These platforms include virtual consult equipment like mobile videoconferencing carts, peripheral monitoring devices to measure patient biometrics, integrated EHR systems and patient portals to expedite information transfer, and HIPAA-compliant software programs that enable virtual visits. Many telehealth and health IT vendors have developed mobile Health (mHealth) applications to track health metrics or promote health education via mobile or web-based platforms. There are dozens of telehealth or virtual care technologies to choose from. But implementers who ask, “What technology should I invest in?” are focusing on the wrong question. Technology is a tool that enables strategy, not a stand-alone solution. To build a successful strategy that effectively leverages virtual care programs and technology, these tools need to be implemented with an eye towards institutional priorities. FIRST: WHY DO WE WANT TO USE VIRTUAL CARE? We start by clarifying why we are investing in telehealth or Virtual Care. We will enlist clinical, operational, financial, and health IT stakeholders to identify core strategic initiatives and challenges that Virtual Care can address. THEN: WHAT TECHNOLOGIES DO YOU NEED TO ACHIEVE YOUR GOALS? Not every technology platform is right for every strategic goal. We will evaluate vendors’ offerings based on their ability to deliver the specific outcomes we are seeking. LET’S NOT FORGET: HOW CAN YOU IMPLEMENT WISELY TO MAXIMIZE SUCCESS? Virtual Care initiatives will be successful only if they are sustainable over time. We must plan and budget investments in the provider community and internal technology, operational costs, evaluating vendor’s partnership requirements, providing workflow redesign, and systematically staging rollout and scaling. Medi-Cal (Medicaid) & Telehealth. In California, the Department of Health Care Services (DHCS) considers telehealth a cost-effective alternative to health care provided in-person, particularly to underserved areas. Telehealth is not a distinct service, but a way that providers deliver health care to their patients that approximates in-person care. The standard of care is the same whether the patient is seen in-person or through telehealth. DHCS’s coverage and reimbursement policies for telehealth align with the California Telehealth Advancement Act of 2011 and federal regulations. State law defines telehealth as “the mode of delivering health care services and public health via information and communication technologies to facilitate the diagnosis, consultation, treatment, education, care management, and self-management of a patient’s health care while the patient is at the originating site and the health care provider is at a distant site. Telehealth facilitates patient self-management and caregiver support for patients and includes synchronous interactions and asynchronous store and forward transfers.” This definition applies to all health care providers in California, not just Medi-Cal providers. Medi-Cal also complies with federal regulations for telehealth, which are the same for Medicaid as they are for Medicare. Medicaid regulations authorize telehealth using “interactive communications” and asynchronous store and forward technologies. Interactive telecommunications must include, at a minimum, audio and video equipment permitting real-time two-way communication, according to the Centers for Medicare and Medicaid Services. Selected Evaluation and Management (E&M) services for patient visit and consultation.Selected psychiatric diagnostic interview examination and selected psychiatric therapeutic services. Teledermatology by store and forward. Teleophthalmology by store and forward. Transmission costs (up to 90 minutes per patient, per day, per provider). Interpretation and report of X-rays and electrocardiograms performed via telehealth. State licensure requirements that require providers to be licensed in the state which they are delivering telemedicine services. Each year, new federal and state legislation is introduced to address some of the barriers to telehealth use. On the state level, more than 150 telehealth-related bills were introduced in the 2016 legislative session, the majority of which addressed reimbursement in Medicaid programs and/or among private payers, established telehealth professional board standards, and addressed cross state licensing. The healthcare industry can deliver better care and increase access using Virtual Care. We must continue to leverage the latest technology and workflow reengineering to innovate and meet both the current and future needs of patients and providers that serve them. Virtual Care empowers individuals to manage their health and care in new ways. We are now at the tipping point where remote monitoring and real-time meaningful interventions will fundamentally change the way populations engage in their health. We must deploy Virtual Care strategies to meet the needs of a growing healthcare consumer base. These strategies cover a wide range of services and approaches, including increasing access to psychiatry, connecting members in rural areas to specialists, using electronic consults (eConsult) to enhance communication between providers, and integrating physical and mental health. We must also investigate and implement services that enable patients to speak with their own doctor, lets them interact with a doctor they don’t, know for simple questions — great for the uninsured or limited insurance and those without a primary physician. Virtual care leverages technology to coordinate care and extends the settings in which care can be delivered. Virtual care can take place through a video conference, over the phone, or through electronic messaging, including images, test results and other data. Consultations can take place between a doctor and a patient, or between two or more doctors. Virtual Care can help patients who live in areas with few specialists get the care they need more quickly or more conveniently, sparing them a long trip. It can also help specialists with heavy caseloads dispense care more efficiently, providing consults to primary care physicians (PCPs) and providing direct access for patients with more complex needs. This increased coordination not only addresses access problems; it also can help bend the cost curve. Virtual Care, provided remotely from a clinic or hospital directly to a patient at home, using existing and inexpensive technologies, continues to grow as part of the value-based care approach. Tracking our patients remotely, whether to manage chronic conditions through a prescribed device or kit, or through an ecosystem of apps enabling patients to manage their day-to-day health, is the future.